… [T]he perinatal death rate of LICENSED homebirth midwives in Colorado, caring for low risk patients, exceeded the perinatal death rate of 6.4/1000 for the entire state (all races, all gestational ages, all birth weights, 2003-2007)! Homebirth was the most dangerous form of planned birth by far. If she’s going to be at the forefront, then she had better get out there. 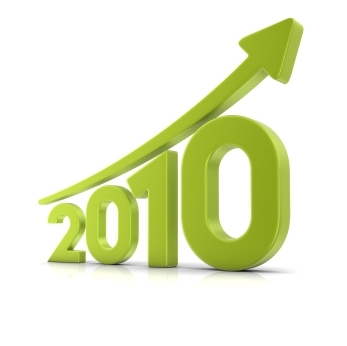 The just published statistics for the year 2008 are even worse. Last year, licensed Colorado midwives had a perinatal mortality rate at homebirth of 8.6/1000. These numbers are nothing short of horrifying. Amazingly, the 2009 statistics are far worse. In 2009 Colorado licensed midwives provided care for 799 women. Nine (9) babies died for a homebirth death rate of 11.3/1000! That is nearly DOUBLE the perinatal death rate of 6.3/1000 for the entire state (including all pregnancy complications and premature births). The data is conveniently broken down by type of death and place of death. For example, there were three intrapartum deaths for an intrapartum death rate of 3.8/1000, more than TEN TIMES HIGHER than the intrapartum death rate commonly experienced in hospitals. There were 4 neonatal deaths for a neonatal death rate of 5/1000. That’s TEN TIMES HIGHER than the national neonatal mortality rate for low risk hospital birth with a CNM. On hundred women were transferred in labor or after delivery for a transfer rate of 12.5%. The neonatal death rate in the transfer group was 50/1000, an appalling neonatal death rate ONE HUNDRED TIMES HIGHER than that expected in a group of low risk women. What can we learn from these data? 1. 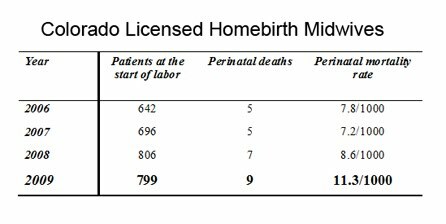 Planned homebirth with a licensed midwife in Colorado has a death rate that is extraordinarily high and has risen in every year since statistics were first collected. 2. Colorado homebirth midwives have an intrapartum death rate 10 times higher than expected. 3. Colorado homebirth midwives have a neonatal mortality rate 10 times higher than expected. 4. Colorado homebirth midwives fail to transfer enough patients and fail to transfer them in a timely fashion. 5. One in 20 patients transferred to the hospital by Colorado homebirth midwives ends up with a dead baby. I recently asked how many dead babies does it take to convince a homebirth advocate of the dangers of homebirth? Evidently, there is no limit to the number of dead babies that Colorado homebirth midwives think is acceptable. Hopefully the Colorado Legislature is not nearly so irresponsible. The sunset review should conclude by letting Colorado direct entry midwives ride off into the sunset permanently. Like all American direct entry midwives, they are grossly undereducated, grossly undertrained, and, as a consequence, unbelievably dangerous. ← Is natural childbirth a form of quackery?